Why and how we serve....a vivid reminder! Belle Fourche Lions have contributed to the SD Lions Foundation through raffle ticket sales. Thanks! 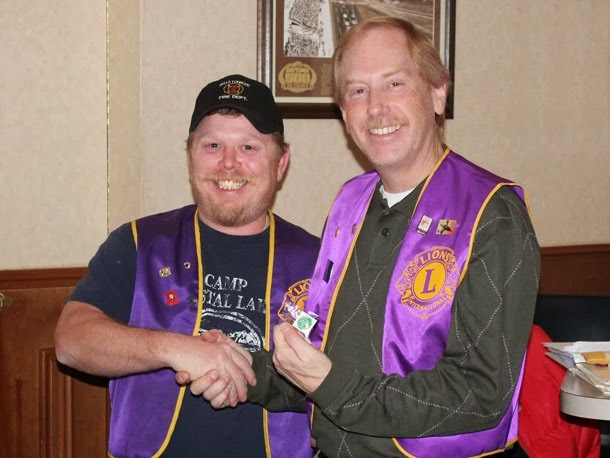 Belle Fourche Lions Club president Rik Bartels (left) congratulates Brian Kline on receiving an award for perfect attendance during the past year. Kline, immediate past president of the club, received the award at the December 12 meeting. Taking a break for the Christmas holiday, Belle Fourche Lions will next meet on Thursday, January 9, 2014!